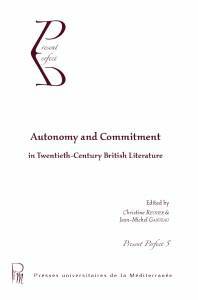 This collection of essays means to explore the interaction between autonomy and commitment in an attempt at revisiting and possibly, revising conventional literary history. Until recently, literary history has indeed tended to present twentiethcentury British literature as either autonomous or committed, but such a position certainly needs qualification. By addressing the joint issues of autonomy and commitment and basing their arguments on such theoretical writings as those of Adorno, Benjamin, Jameson, Rancière or Attridge, the essays presented here come to question the canonical definitions of modernism as experimental literature, the literature of the 1940s and 1950s as committed and post-modern fiction as self-reflexive and autonomous. Through reflections on experimentation and ideology, narcissism and metafiction, aestheticism and militancy, abstraction and ethical involvement, they flesh out the very definitions of autonomy and commitment, confront the two notions and relentlessly test their interaction, thus bringing out the complexities and subtleties of the various moments and movements that make up the literary landscape of the 20th century and the beginning of the 21st. Writers such as Vernon Lee, Mina Loy, Stevie Smith, Rosamond Lehmann, Malcolm Lowry and Graham Greene are examined side by side with Ezra Pound, James Joyce, Aldous Huxley, D.H. Lawrence or Virginia Woolf, Brigid Brophy, Anthony Burgess, Philip Pullman, Emma Tennant, Hilary Mantel, James Kelman, Russell Hoban and Zadie Smith are studied together with John Fowles, Martin Amis, Will Self and David Mitchell so that the whole volume reads as a tentative re-mapping of British modernism as well as an original mapping out of contemporary British literature. 2010, 16 × 24 cm, 25 €, 304 p., dos carré collé, ISBN 978-2-84269-890-4.